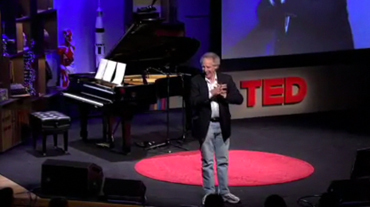 Hugh Garry: The best TED talk....EVER! TED is one of my favourite sources of inspiration. TED takes my mind off the smell of piss during my many journeys from Manchester to London on Virgin Trains. TED joins me in the bath at the end of a long hard day at work when I feel I’ve just not taken enough out of the day. Much to my girlfriend’s annoyance TED even comes to bed with me some nights when I needs something other than 5Live to drift off to. Until recently my favourite ever TED talk was J.J. Abrams’ Mystery Box, which I beg you all to watch at sometime. Whether you are a fan of Lost or not you can't fail to be gripped by his explanation of the value of the untouched and unseen contents of the cellophane wrapped box he holds in his hand. Laurie Anderson famously once said ‘Writing about music is like dancing about architecture’, which is why Benjamin Zander’s talk on why ‘we all love classical music, we just don’t know it yet’ is so special and has, for now, become my favourite TED talk. By it’s very nature the idea of musicians taking one sound, putting it next to another and creating something quite beautiful and unique is an abstract concept. As a result a majority of the writing about music that does fill the pages of magazines and blogs usually falls into the ‘This is really good’ or ‘This is really crap’ camp. As a talented conductor and genius storyteller Benjamin must have been taught architecture by Gene Kelly. He dances through the structure of his 20 minute talk with so much humour, passion and melancholy you’ll feel like you’ve waltzed around the cities of Rome, Vienna and Disneyland in one session. “The Job of the ‘B’ is to make the ‘C’ sound sad” he explains and as he gently hits the ‘B’ then the ‘C’ the audience erupt as if they were hearing music for the very first time. And from that high, the high of a ‘B’, Benjamin wraps the whole thing up with one giant ‘C’, which I won’t give away here. Needless to say his parallels between the power of music and the power of the spoken word left me more inspired than ever... or as he'd put it 'Shiney eyes'.